The international community is escalating its commitment to winning the Syria conflict to unprecedented levels. Last week the Obama administration promised more direct funding to the rebels fighting Syria’s army. This week, Australian foreign minister Bob Carr suggested that assassinating the President of Syria might be a wise and necessary option. Prime Minister Erdogan of NATO member state Turkey talked about his country’s readiness for war with Syria. If you listen to the Bob Carr’s full interview on Australia’s ABC network you would hear a question that starts with: “most of the reporting suggests fairly consistently that it is only a matter of time before the regime falls”. Expectations of imminent and not very costly end of the regime, which is assumed to be the very definition of “success”, has been for the past 20 months one of the main pillars in motivating members of the alliance led by the international community trying to topple the regime in Damascus. No one asked Prime Minister Erdogan about his statements one year ago that “Assad’s days are numbered”. The regime’s days are numbered. Regime opponents can do it if they work with us for a few more weeks, that’s all it will take. Syrians will thank us for helping them topple the regime. It will be good for Syria. If only we topple the regime. A short transition period might be difficult, but soon after democracy and all other goodies will be within reach. “The Syrian People” want us to topple the regime, not reach a compromise with it. Can’t go wrong if you are on the side of “the Syrian People”. The people have one thing on their minds … change, full and total change. The price to pay for revolutionary change is not too steep. The Syrian people are willing to pay that price over the much lower cost of pursuing evolutionary change options that do not follow “The Arab Spring” formula we find more exciting here in the US. Syria will not be destroyed in the process, its economy will be easy to recover. The people will work together after this civil war. Working with the Islamists is inevitable and wise. The west can use the power of the Islamists to fight and topple the regime, THEN the west can install secular Syrian opposition allies and remove the Islamists from the scene. If Islamists win the next elections in Syria, it will be not a problem. They will be under control and guidance of Turkey’s moderate Islamists. All these assumptions were made without consulting “the Syrian people”. After initial symbolic demonstrations in Daraa and Damascus, western governments and media started to make all the above assumptions. No one wants to explain where the 250,000 dedicated soldiers and officers that make up the official Syrian army come from if they are not part of “the Syrian people”. 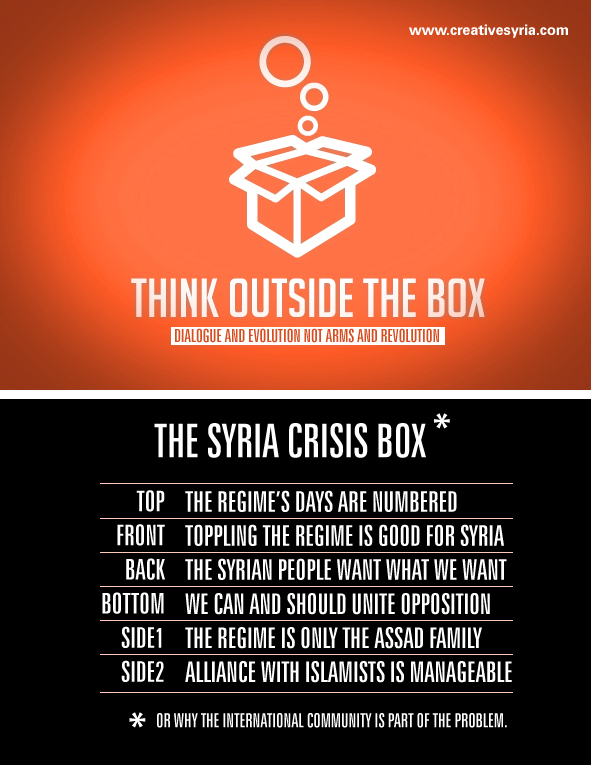 Finding a way out of the highly dangerous crisis in Syria will require some thinking outside this convenient box. Outside this box you might be able to realize that victory is much more costly and uncertain. That secularism might be a much better alternative to experimenting with Erdogan’s Muslim Brotherhood allies and Saudi Arabia’s Salafis, and most of all that the Syria crisis is much more than that. It is the Middle East crisis. The United States has to face all the regional conflicts that it has been avoiding for decades. The Syria crisis is not about Assad staying in power or not as they want you to believe. It is the last warning to Washington to re-engineer its broken Middle East policy making machine before it is too late. You can make it look to be anything that you want but the fact of the matter is that this crisis is about the failure of the Baath regime as represented by the Assad who have appropriated it for decades. It is as simple as that. Had the regime been democratic, had it been successful in raising the level of welfare and had it respected the human rights of its citizens instead of unleashing the power of the army to silence dissent then none of this would have happened. The destruction of Syria lies squarely on the shoulders of in man Bashar Assad. He has proven to be an egotistical, delusional , heartless , self centered , conceited and vain. @ghassan karam 1) “the fact of the matter” is that opinions stated as facts are opinions not facts.2) “the failure of the Baath regime” is not absolute. Here is a chart from one of the earlier articles on this blog, it gives you my opinion (not fact) of the the different degrees of successes and failures for Bashar Al-Assad for examplehttp://creativesyria.com/syriapage/wp-content/uploads/2012/04/popularity-per-area.jpg3) This post is about the false assumptions the US made almost from day 1 of the crisis and how they are part of the reason we are not reaching a solution in Syria that would stop the bloodshed.